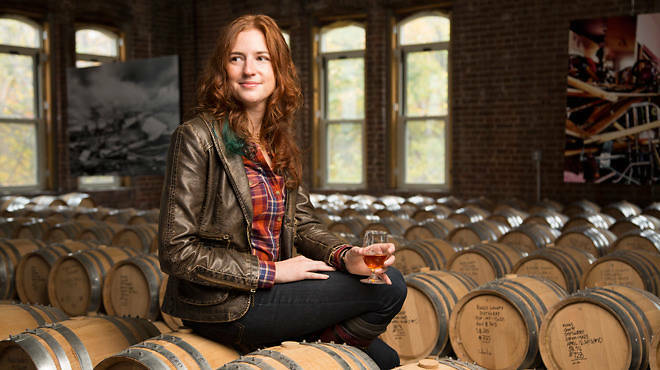 Yes, we're jealous of master blender Nicole Austin, too. But don't worry, it's not as great as it seems. Oh, who are we kidding…? As a whiskey consultant and master blender at Kings County Distillery, Nicole Austin gets paid to taste whiskey for a living—and it turns out that the gig is as awesome as it sounds. How does one even break into whiskey consulting? I work at a two-man firm with Dave Pickerell. He was the master distiller at Maker’s Mark for 14 years, then left to start his own craft-distillery consulting company seven years ago. He hired me last year. He could not keep up with the growth in business. What does being a “master blender” entail? I’m in charge of blending all of the bourbon and whiskey: deciding when it’s ready to come out, taking it out of the barrels and deciding which barrels go together. It’s also being responsible for the flavor profile. So you have to taste each barrel? I do, yeah. Sounds dangerous. I understand the taste can vary greatly from barrel to barrel. Yeah, huge. And it’s not like there’s a sommelier program where you can go for training. It was a learn-on-the-job thing. When I first started tasting our barrels, I thought we were doing something wrong, because they were so, so different. I thought we were screwing up, but I talked to other people and it turns out that’s the nature of it. Do you ever wake up and wonder how you’re going to get through another lousy day of your dead-end job getting paid to taste whiskey? I feel like I haven’t gone to work for a single day since I quit my old job. I worked for an environmental engineering firm. It was a corporate job. That felt like going to work. But with distilling, it hardly ever feels like work. Did anyone go as Donkey Kong for Halloween? [Laughs] I think the only one who could even do that would be Matthew, who is like our plant manager. As far as I know, he’s the only one who could lift those barrels over his head. Visit Kings County Distillery! Tours are conducted every Saturday (2:30–5:30pm; $8) in the Brooklyn Navy Yard, enter at Navy St at Sands St, Dumbo, Brooklyn. Visit kingscountydistillery.com for more information.